I’ve posted before about sea gulls and in fact this very boat ride to Telašćica Nature Park in Croatia. I like this picture because it is full of action, you only can see a bit of what is going on, yet you can still imagine the entire scene. I can imagine the birds having a conversation. It is almost a landscape shot, but the action in the corner upsets it. I like images with some kind of disturbing factor in them. What do you think? Is the picture too lopsided? What does this image evoke in your mind? 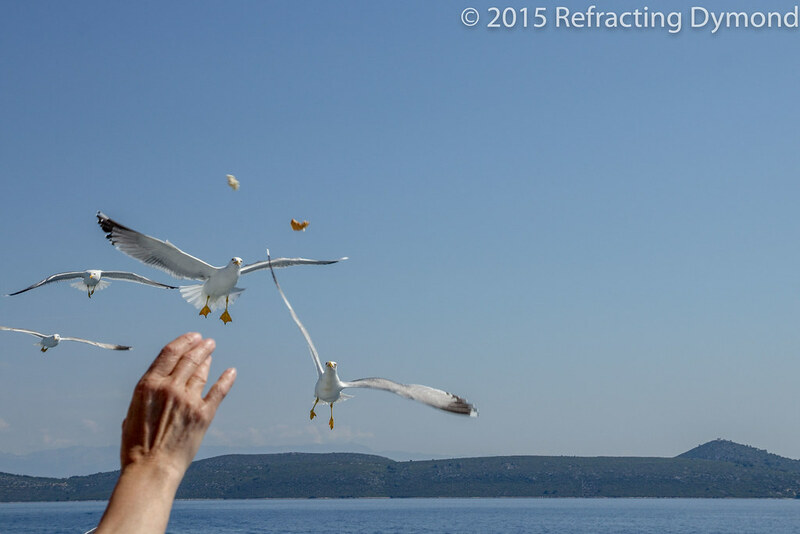 This was an easy shot – almost a happy accident – because the birds were following the boat and I kept snapping away. I set the aperture in AV mode, as I didn’t want to keep adjusting. I was trying to capture the birds, but the person throwing the bread got in my way. I figured rather than get angry, I would work with the person as part of the scene and got this…and it worked out.